Food service is very popular all around the world. it can be located in the shopping center, street or your own store. 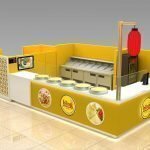 in this article what I wanna share is a mall used modern crepe kiosk design. if you’re interested to start your own food business, pls follow me see more details below. You can see the whole kiosk mainly tone is brown and beige wood grain. the basic material of this kiosk size 3m by 3m, the basic material is fire retardant plywood, the surface is fireproof plate. beige color Corian countertop. stainless steel skiting on the whole kiosk bottom. The front part of the whole kiosk mainly for crepe making, here have two crepe machine and topping area, you will notice here with a “U” shape glass panel. the left sides of this kiosk is a 1.8m height signs showings, with menu lightbox, the customer can direct choose and order here. the next to is an oven. 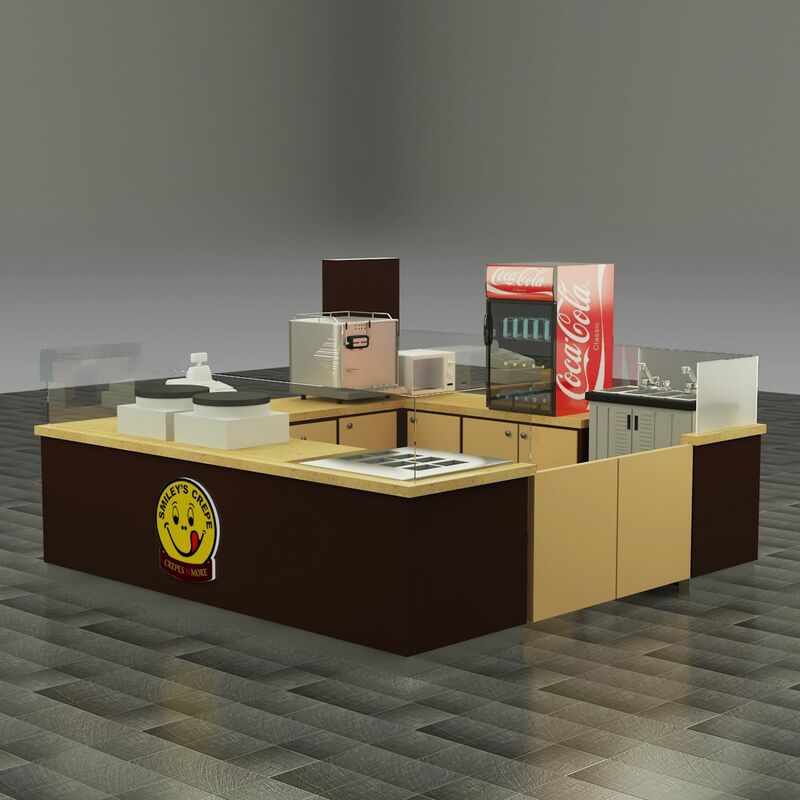 the back side of this kiosk is the wooden counter, here will put three holes stainless steel sink and a The coke machine, the bottom of each counter is some wooden cabinet. it’s very good for storage. Color: brown, beige wood grain. Service: crepe, coke, juice and more. Accessories: tempered glass, lightbox, stainless steel logo. 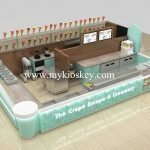 How can I customize a crepe kiosk like this one? 2. Rent a store or a leas the in shopping mall, but need sure the location environment, Bustling, with enough people flow. If you have your own storefront, then you can decide all the details on your own. On the contrary, if it is used in the shopping mall, it must meet the criteria of the shopping mall, ( usually mall criteria mainly for material, height, and electrical wire safety, if your design team enough professional and experience, it’s Easy to approve）. 3. Find a direct supplier make a 3d design and drawings. — as a direct supplier, before designing we will confirm the shop layout, style, color match, material requests, etc . also can give you some professional advice. then we will start design and put all of your ideas on it. confirmed the design and start making drawings. ( you can see all details here, with each part size material and surface finished details, will according to the drawing production ) . Thanks for your time and reading, as a direct supplier we mainly work on the design and customized different types of mall retail kiosk. 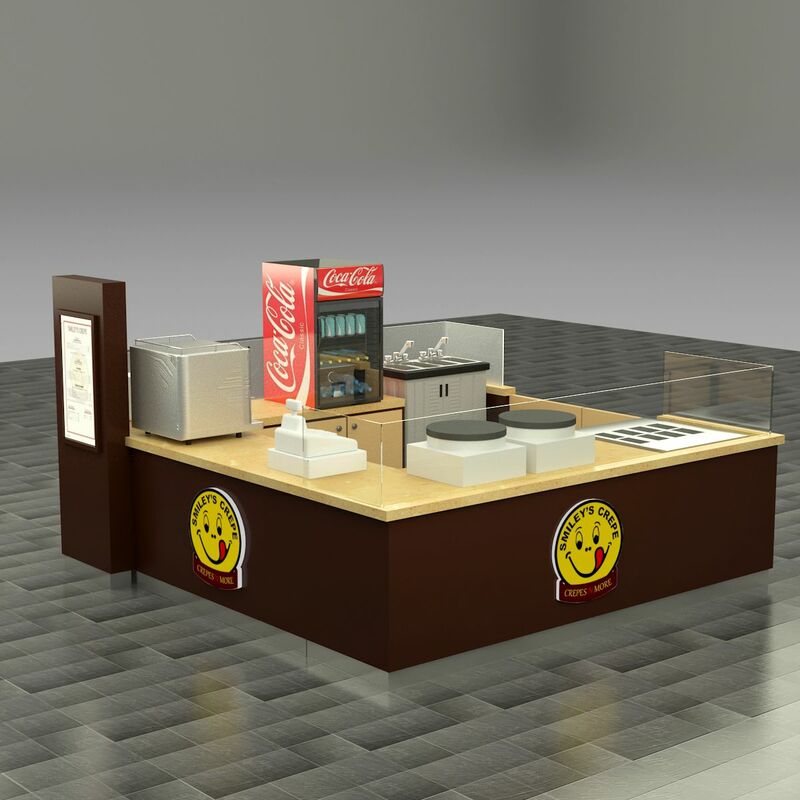 if you’re interested to know more details about this crepe kiosk, or plan to start your own mall retail kiosk. can check more relate design on our crepe kiosk website. welcome inquiry!